They say the key to success is preparation. (That's what they say right?) This year, we are hosting Thanksgiving at our place and there is the possibility that my sister from Toronto might visit. Thus, I want it to be extra special. 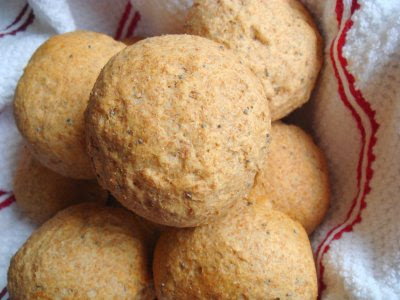 I decided to serve rolls with dinner this year and have been working on a recipe for whole wheat poppy seed rolls. This is what I came up with. 1. In a large mixing bowl, combine yeast, sugar, 1 cup of flour and water. Set aside in a dry place away from drafts until foamy, 10 to 15 minutes. 2. Add the remaining one cup of flour and poppy seeds, and mix until it all comes together. Remove dough to a dry floured work surface and kneed for 5 to 6 minutes until smooth and elastic. Sprinkle a little dry flour if dough becomes too sticky. Place in a large greased bowl and set in a dry place. Let rise until dough doubles in size. 3. Form into rolls and arrange unto a greased baking . Allow to rise for for a second time until almost doubled in size. Bake in a preheated 350 degree oven for 30 minutes. I've been wanting to try making more rolls instead of loaves of bread. This sounds like a great recipe. I'm curious..is it white whole wheat or regular 100% whole wheat flour ? Dear Anonymous, I used regular whole wheat flour here. My Grandmother likes to make poppy seed flat and then roll it up and slice it. Would that work for this recipe?